Disclaimer: The current 'economy' of CS is always changing. This guide is just that, a guide with guidelines and examples. I am using my own experiences so the rate of what dog goes for what dog WILL differ. Okay, you've signed up for CS. Now what do you do? You've looked through the Archives and see a brilliant star dog that catches your eye. According to the Archives, it is a July dog from last year. Not many people were around in July 08 dog, so there are statistically not many of them. This is a dog that no one will just give away and your pleas for a July dog won't work. So what do you do? 4 A Rare is a rare? 6 Optional Step: Find your neighbors! You're not going to get anything if you have no pets to trade with! Grab some of this month's pups from here Matter of fact, get everything! Horses, cats, rats everything that up for the month. You may not like or want them but chances are, there is someone else that does and would be happy to trade with you. Okay, now that you some of those pups brewing, visit the CS Free Adoptions forum. Typically, last months pets are in there. Ex: it is Dec, so most people are giving away November pets. The December advents are rare in a sense due to the manner of how they were handed out, so it will be difficult to find pets in the month of January. February the cycle will return to normal. Check back there often and grab any pet you don't have. Also, visit the pound upon login and every 30 minutes you are online. If you are lucky, you will catch it open and can add a dog you don't have to your own collection. If you catch a dog you already have, use the dog you already had as fodder for trades and keep the pound pup. Now that you have a few more pets and your newborns are puppies, try using some of the free extras you got to trade for the ones in that set you don't have. Try to complete your own set of pets you want to keep and a set of monthlies for trading. Now is the time to watch the trade board intently. Watch what is being traded. Write it down if you have to to learn what each pet is currently 'worth' in the economy. Pay attention to who is posting and look at their wishlist. The link to a person's wishlist is located below their avatar on any of their forum posts. If they are looking for a relatively easy way to get pups, keep them in mind. If you are lucky, some user might see your wishlist and decide they can just give you one of their extras. By now your current month's pets should be adults. If you are lucky, you might have a rare or two. This will help you upgrade. All that stalking you've done in the trade board? Time to put that to use. Trade a rare of this month's pet for a set of commons of last month's pets. Then use whatever you have in your trade section leftover to get the remainder of last month's pets. Congratulations. You have now upgraded. Grab the new month's pets. Take the last months pets you have and create a post in the trade board mentioning you are looking for pets (month before this set). Check back often to bump it if it gets to the 2nd page. If no one seems to be interested after a week of it being up, offer the whole set for a single dog of (month before this set) or split it in two and offer half the set for one dog and half the set for another. December is a 'rare' month based on how they were given out. Might want to just skip December altogether and just look for November or October pups. A Rare is a rare? So you have a rare, right? Surely you can trade it for another rare right? Generally the more seasoned players will get angry at you if you try such things, but it will make anyone bonkers trying to learn all the 'invisible rules'. Try not to get discouraged from angry trade messages. Perhaps PM the person and ask why it wasn't a fair trade. Or even before you set up the trade, you can post in The "Is this a fair trade?" thread. With three commons of (month before this set), trade for the one dog that is most wanted of (month before this set) Keep in mind that Augusts and Julys are difficult to get, so just keep trying. Keep reading the trade board, see if anyone is offering a dog you don't have. Before you make a trade offer, check their pets. Do you have a dog or two that they don't? Keep looking on the trade board for someone trading am early 08 dog. Sometimes people are willing to trade even if it is something they already have if the trade is in their favor. For example, someone that has a blue balloon dog might trade it for the pink balloon dog they already have if you add in a September leopard dog because it makes their trade section bigger. Now that you have the blue balloon dog and an extra set of the pets from the month you joined in, trade all of them for the July galaxy dog you've been wanting. Congratulations. It has taken you three months to get the dog you wanted, but you obtained it much faster than you would have, had you not taken any action at all. Optional Step: Find your neighbors! By far a very tedious and lengthy step but can also be very rewarding. If you are having difficulties getting that last dog in a set (For example, the rose PPS from September) and no one is taking an otherwise good trade, it's time to go outside the box. There are a number of CS users that don't use the forums. To find them, first you find a dog in that same month. For example, You are looking for the rose PPS. You have a target dog. Click on it. 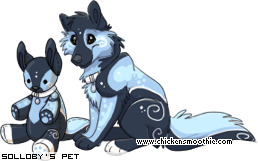 You can also look in the CS Adoptables section for dogs of a certain month to click on. See the spot where it says id=127320? add one to that number. Keep adding one until you find a pet that is the one you want. If that pet is not in a group, then you can do nothing. If it is in a group, there is a chance that you can also see "Make a trade offer for this pet" underneath it. If you have some pets they are missing, offer them. Put text in the trade box. This shows that you have done your research and are not just giving some random trade. Indicate that you saw that they had an extra, that you are looking for this pet and saw some pets they did not have. Be polite by asking if the trade is okay. You should know by this time if what you are trading if a fair trade. Be sure to thank them for their consideration. I got many of my own first rare pets in this fashion but it took a long time and a lot of work. If you are good at drawing, hire yourself out at CS Adoptables for art/etc. Many people will pay that rare pet for a new signature, avatar or art piece. CS has a very friendly community. Friends help bump your trade posts if you are offline and sometimes you get gifts. Every little bit helps. You will get quite a number of 'nos' before you finally get your 'yes'. The important thing is to remain courteous when asking for trades, otherwise it can be seen as begging. With the site getting an increasing number of timeouts, general errors, pages not loading it will take a very long time to go through someone's collection of pets to see what they are missing, it may be best to try trading when you are doing something else. I'll often read books. While I'm reading though, I'm at the computer waiting for a page to load or a wall of pets so I can compare. It makes the process less painful. This page was last edited on 29 October 2011, at 16:07.